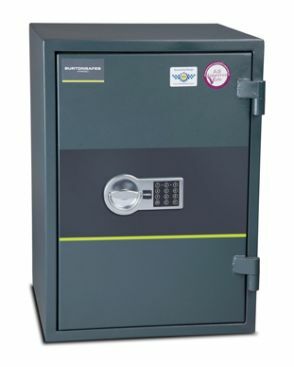 Burton Safes supply one of the largest ranges of safes available anywhere in the world. This includes freestanding safes, hotel room safes, deposit safes, fire safes, key safes, underfloor safes and wall safes. Our flagship ranges are the Eurovault Aver and Eurovault Atlas safes, which come in a large number of sizes, security levels and locking options. Included within these models is Europe's highest rated security safe, Eurovault Atlas Grade 7; something we are very proud of. Our safes are independently attack tested and certified to exacting European standards, EN1143-1, EN1143-2, EN14450, and EN15659 & EN1047-1. We only use the most prestigious certification institutes, ECBS, VDS, SBSC and ICIM to test and quality check our safes. They regularly audit our factories and production to ensure high standards and consistency are maintained. All of this means that you can have complete confidence in our safes protecting your valuables in the event of attack.